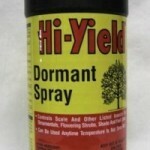 PRODUCT DESCRIPTION: Dormant spray is very effective in controlling a wide range of Scale, Mites, Fruit Tree Leaf Rollers, Bagworms, Pear Psylla, Fall Armyworms and Whiteflies on Ornamental, Shrubs, Fruit Trees and Shade Trees such as: Tea Scale on Camellias, Oleander Scale on Oleanders, Juniper Scale on Junipers, Azalea Scale on Azaleas, White Peach Scale on Privet, Scale on Citrus Trees, Rose Scale on Roses and Magnolia Scale on Magnolias. Generally used in the winter months, Dormant Spray is a good choice for use on plants and trees with a recurring history of insect problems. Dormant Oil may be mixed with other Insecticides and with Fungicides except those containing Sulphur. Dormant Oil may cause plant injury to House Plants such as Ivy, Ferns, etc. WHERE TO USE IT: Ornamental, Flowering Shrubs, Shade and Fruit Trees. RATE OF APPLICATION: Mix 1.5 to 3oz in one gallon of water. Spray foliage thoroughly. Do not apply when temperatures are above 90 Degrees F. Spray in the afternoon or early evening. 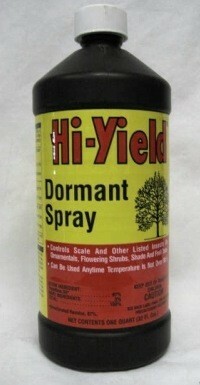 I am just curious what will happen once I spray the bag worms with the dormant spray. Will they fall off of the tree? Your site has been extremely helpful. I was completely oblivious to the problem this summer and now that it's the middle of winter I'm noticing how pathetic my hedge row of evergreen trees looks and they are riddled with bag worms. I'd like to get it under control asap! No doubt now is a good time to treat over wintering bag worms using the above listed dormant oil. But experience has shown its not likely to cure the problem. Additionally, the treated bags will likely hang around for many months. So here's the best way to proceed. First, treat any and all bags you can see at this time. Saturate them by spraying the dormant oil using a standard pump sprayer. Next, let the treated bags continue to hang for at least two weeks. After two weeks, remove as many as you can find and either burn them or make sure they are carried away by your local waste removal company (trash service). Unfortunately this won't take care of the overwintering eggs which are typically found in the ground and bark of trees throughout the landscape. So come the soon to arrive spring, they'll start hatching and once alive and thriving, they'll migrate back up and onto these very same evergree trees you're about to treat. To prevent this from happening, you'll need to spray the trees and surrounding ground with the Bifen and Spreader Sticker mix. Do this once a month starting in April and follow the routine from through September. And if you follow this procedure, you'll kill all the hiding and hatching larvae and in turn, eliminate the problem for good. But if you fail to treat with the Bifen/Spreader Sticker mix this spring through summer, the problem will simply reappear. Now you may ask what the point is of treating the bags now with dormant oil and the answer is simple; treating now will impact a big percentage of the overwintering stages and it will definitely help. But will it solve the problem? No. That can only be achieved by treating during the spring and summer too. Thanks for the info on bag worms! They are in my weeping cheery tree. Gotta spray it can't loose my tree. Thanks for the tip!